...and what you can do! Note: The Supreme Court declares PDAF unconstitutional. Technically speaking, the palace has junked PDAF a long time ago (October 10) as announced by Edwin Lacierda. Read through the article to find why the People’s Initiative Against Pork Barrel is a cause that should be grander than removing the PDAF. (SPOT.ph) It may not be purely coincidence that the People’s Initiative is abbreviated to "PI" because for something like that to happen, a majority of the population must be unleashing a litany of curses towards the government. After the appearance (we hesitate to call it a hearing now since... you know, we barely heard anything substantial) of Janet Lim Napoles in the senate, Former Chief Justice Reynato Puno’s call for the people to take matters in their own hands early October surfaced once more. âÂ€¢ What is the People’s Initiative? The wonderful thing about living in a democracy is that power isn’t centralized. We often hear about the judicial, the legislative, and executive branch and they all serve as a counter-check for each other. But P-Noy’s claim that we are his boss isn’t a trite slogan-it’s the truth. The very reason why a president is called a president is because he presides (i.e. oversees), not dictates. We have more power than he has, a fact for which his own parents are proof. Now, to put it simply, the People’s Initiative is a way to amend the Constitution itself without having to go through Congress (and stuff). It is written on a piece of paper that we the people actually have the right to directly propose changes to the Constitution...provided that we are reasonable about it. Former Chief Justice Puno mentions "the reserve power given to the sovereign people in 1989 by Republic Act 6735." âÂ€¢ What is the "reserve power" of the sovereign people according to R.A. 6735? or to propose and enact legislation through an election called for the purpose. This power may be exercised by all registered voters in the country...which hopefully includes you. Ten percent (10%) of the total number of registered voters shall sign the petition that will be registered/submitted to the Comission (on Election)-that’s about 5 million people. Under this, three percent (3%) of every legislative district must be represented. The petition needs to include, among others, the law that needs a makeover or complete overhaul, the proposed replacement, the reasons (very important, we assume), and the signatures of the petitioners (or voters). The Commission on Election will then schedule a special election of sorts to determine whether or not a majority of voters agree to the petition that has been submitted. âÂ€¢ What the flying cow does this mean for us? It’s clear that the Million People March didn’t exactly live up to its name but according to news reports, about 90,000 signed on site to scrap the PDAF and about 15,000 more signed online. We’re speculating here but a lot of disappointment must have been felt after that rather historic moment when the middle class got down and dirty (it was muddy) to express their disapproval over how the PDAF has been misused, because months later the topic seems to still be up for debate. Beyond the Internet, a physical petition must be created, i.e., printed on paper and it must contain the text that details what the petitioners want to happen. Everyone signing it must read it and more importantly, understand it, because it will be the enacted law. Draft the petition to scrap the pork barrel (hopefully, with proper legal counsel). Ensure that each legislative district is represented. Coordination is key. The hard work is getting through to the population, i.e., representing each legislative district. Online petitions are great but remember, less than 50% of the Philippines have access to the Internet and not all areas have electricity (this is sad, we know). More importantly, the petition needs actual, physical signatures and this means it takes grunt work to represent each legislative district from the entire country. Which group or groups will work to make that happen? âÂ€¢ Where’s the buzz about this? How has the response been? 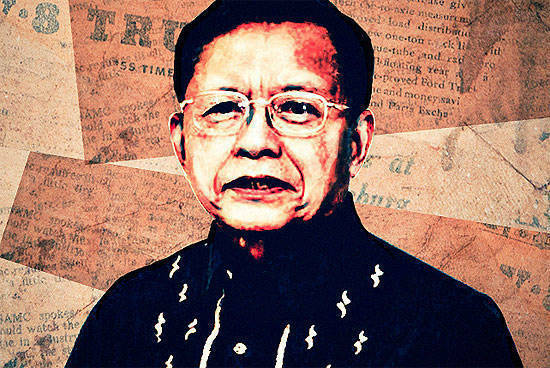 On October 22, GMA News reported that Former Chief Justice Puno will finish drafting the petition by November with the referendum set for January 2014. The report claims that it needs about 10 million signatories to pass but in a separate, earlier report by Inquirer, Senator Miriam Defensor-Santiago makes three counterpoints. First, the petition needs not 10 million but about 5 million signatures (there were 50 million registered voters in 2010). Second, that’s still a pain to collect because it involves explaining a lot of things to a lot of people. And third, the petition isn’t the best course of action. Militant groups such as Youth Act Now support Puno’s petition but Senator Santiago offers the enactment of Budget Control and Impoundment Act as the better alternative. The Budget Control and Impoundment Act was proposed by President Benigno Aquino III himself, when he was still in the Senate. Senator Santiago is pushing for its approval and in a nutshell, it preserves the "power of the purse" held by Congress. Now, that seems a tad bit silly seeing as the reason why we’re all in this fix is because of the mismanagement of funds by these very people but the Act seeks to "limit executive influence over specific appropriations" and if that all still sounds like legal blabber, it translates to removing the President’s seemingly limitless control over the national budget. Senator Santiago was referring to the "juggling of funds" that happened after Renato Corona was impeached. The extra millions that the senators admittedly received after the impeachment trial is technically not part of the Pork Barrel Scam but it is still a clear misappropriation of funds. If passed, the Budget Control and Impoundment Act will prevent this mid-year re-allotment of funds for dubious "projects" that weren’t approved by the Congress during one of their big budget meetings. What people forget is that scrapping the pork barrel removes the pork barrel but it doesn’t cure the kleptomania (as Mel Sta. Maria puts it in his opinion piece for InterAksyon.com) that has gone rampant. âÂ€¢ So is that the solution? Only partly. The People’s Initiative is worth the effort because scrapping the pork barrel seems like a good idea-they don’t use it properly anyway. But it’s only the beginning. We get Senator Santiago’s point and this is somewhat backed by Archbishop Emeritus Oscar Cruz’s stand on the matter. We may not always agree with him but when he said that "it’s not enough to scrap the pork, we must get rid of the pigs," we were right behind him. Back in August during the height of the Million People Movement’s momentum, Professor Prospero de Vera expressed his worry about the oversimplification of the problem. He said that "scrapping the pork should be the last step, not the first" and the first step "should be to have a full accounting of the discretionary funds of all three branches." If that sounds familiar it’s because that’s exactly what the Freedom of Information Bill wants to happen. So if the People’s Initiative can be used to scrap pork, perhaps we can also elect to have the Freedom of Information Bill passed on our own. Once again, here is the full text of Republic Act 6735 for your perusal.